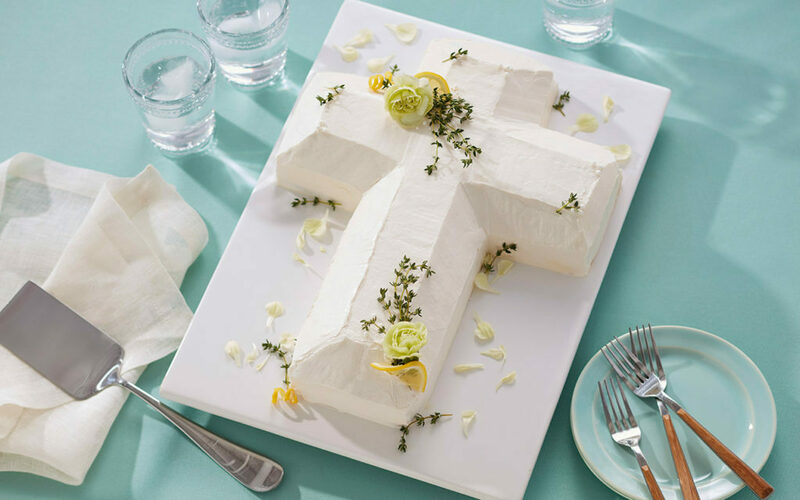 A time for solemn reflection and celebrating new beginnings, Easter is the perfect occasion to share a beautiful cross cake with the ones you love. Today we’re sharing our favorite buttercream icing ideas for easy-to-decorate cakes that are both elegant and delicious. For even more Easter inspiration, check out our Easter page here or shop the cross cake pan here. Beginner decorators will love this easy-to-adorn variation of the traditional cross cake. Scatter handfuls of fresh flower petals, herbs and lemon slices over the top. We recommend using the Lemon Basil Cake or Sweet Meyer Lemon Pound Cake recipes to compliment the bright and flavorful toppings. Simple yet beautiful, this straightforward cake is perfect for decorating with the kids! From religious ceremonies to the earliest spring buds, purple is one of the colors we most associate with Easter. Pay homage to the royal hue with this vibrant two-toned cake. To create this elegant dessert, use a spatula to ice the cake and pipe rosettes across the center. Perfect for Easter, baptisms or quinceañeras, the colors of this cake can be easily adapted to suit any occasion. Inspired by the daffodils and crocuses that appear in the spring, this eye-catching cake features vibrant stripes of yellow and violet. Intermediate decorators will enjoy showing off their technique while piping delicate straight lines of icing. Sprinkles add a touch of whimsy to this stunning centerpiece. Will you be trying one of these projects this Easter? Show us how it turned out by tagging @WiltonCakes in your photos, or share your favorite Easter dessert ideas with us in the comments below!